We had a huge issue being seen as a company. We was for all intents and purposes invisable. We was a little off the beaten track. 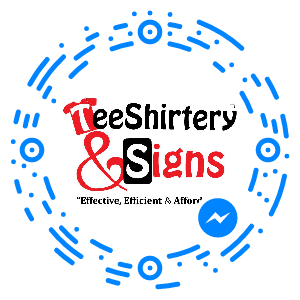 Through an exisitng customer of Teeshirtery we were encouraged to contact them. after playing phone tag a couple of times we eventually got to speak. We can confirm you will always be called back, if a call back is required. I am so glad we did. When we connected the ideas, were literally like a volcano erupting. We could do this we could do that. Ok it all sounded great. But... How much? Thats what motivates me. I am a small business and in rural nova scotia lets just say it doesnt have the population of manhattan. I had a figue in mind. If they could come very close to this figure I would take the chance. Wow. Not only did they come in under the budget. But I was able to get other things as well. New business cards. rackcards for the airport and local shops etc. and still under the figure I had in my head. I am now a strong promoter of Teeshirtery and signs now don't tell them but they may have saved my business and my sanity. Thank you David. We was glad to be able to help you. Especially after the issues you had before coming to us. We are so thankful that things worked out.